In general, two years is the timeline for filing a claim in an Indiana worker’s compensation matter. It is extremely important to note when this period of time begins running, as it differs depending on the type of accident and injury. The law states that an injured worker has two years from the date of the accident to file a claim with the Worker’s Compensation Board of Indiana. 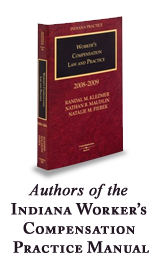 On the other hand, if the accident is the unexpected consequence of performing one’s job duties, such as a repetitive trauma injury, the Court has held that the two year time constraint begins “when the injury is discernible by the employee,” which is usually the date that the injured worker first seeks treatment for the work injury. In the case of a worker who has died as a result of the work accident, the dependents have two years from the date of death to file a claim. If the worker receives disability benefits as a result of the accident for time missed from work, he or she has “two (2) years from the last date for which compensation [includes temporary total disability income, a permanent partial impairment award, and permanent total disability pay] was paid” to do something legally about this worker’s compensation matter. Please note that the last date for which compensation was paid refers to the ending date of your pay period, not the last day that you received a check in your mail. Time limitations for Indiana worker’s compensation claims can be very tricky, but they are VERY important to understand for your particular claim. You should consult an attorney to further explain these limitations.